It was during the Battle of Fort George in Niagara-on-the-Lake that American forces managed to defeat British forces to capture Fort George and use it as a base in their invasion of Upper Canada. Fort George was eventually recaptured by British forces and today, operates as a Canadian National Historic Site. People can visit and tour the fort and experience it as it was in 1812 with the staff dressed in period costume and trained in firing drills. The Battle of Fort George is a major part of the region’s history and a visit to the site is a must-do activity for anyone looking to have a unique educational experience. Laura Secord is a celebrated Canadian heroine who, during the War of 1812, walked 32km to warn British forces of an impending attack from the Americans. It was Secord’s warning that helped British forces repel the attack and because of these brave efforts she is now regarded as an important Canadian historical figure. Visitors can learn more about Secord’s background and story by touring her homestead in Queenston, which has been turned into a museum. Queenston Heights was where the first major battle of the War of 1812 took place and is the site of Brock’s Monument, as well as a monument honouring Laura Secord. Brock’s Monument was constructed in honour of Major General Sir Isaac Brock who was a British officer put in charge of defending Upper Canada against the Americans during the War of 1812. Brock died during the Battle of Queenston Heights and the 56-metre high Brock’s Monument is where he was interred. Visitors can climb to the top of the limestone structure, which consists of a 235-step staircase, and experience incredible views of Niagara from portholes in the monument walls. 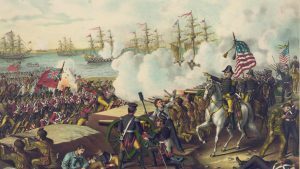 The Battle of Lundy’s Lane was an extremely bloody battle during the War of 1812 and is regarded as one of the deadliest battles that has ever occurred in Canada. Lundy’s Lane in Niagara Falls, Ontario is now a designated National Historic Site of Canada and people can still visit a part of the battlefield that has been preserved next to the Drummond Hill Cemetery. The Niagara Falls History Museum is also located on Lundy’s Lane and is a great place to visit to learn more about the region’s history and the historic battles that occurred during the War of 1812.